Enjoy peace, tranquillity, warm hospitality and personal service at Acacia House Rivonia. We’re situated within a boomed security area in an up market leafy suburb, with easy access to some of Joburg’s best restaurants and malls. All six of the stylishly decorated bedrooms are en-suite and have extra length beds with fine linen. DSTV, WiFi, Bar Fridges, 36 inch LCD flat screen TV’s and tea and coffee making facilities are standard in all of the rooms. One of the rooms has a wood burning fireplace. There are also self catering suites available. Breakfast is served on the sunny patio or dining room over looking the sparkling pool set in a lush garden with an abundance of bird life. We have six rooms in the guest house, four of which are self catering. All bathrooms have both showers and baths. A full English breakfast is served between 06h30 and 09h30 on the sunny patio during the summer months and inside by log fire during Joburg’s cooler months. Dinners are served on request . We’re situated with in a boomed security area in an up-market leafy suburb with quick easy access to all the major high ways. A stones throw and in between Sandton City & The mall of Africa, Morningside Medi Clinic & Sunninghill hospital, Monte casino & Woodmead golf club. Rivonia village is well within walking distance and has lots to offer. Boutiques, hair, & beauty salons, shops, restaurants, coffee shops, banks, a chemist, liquor store & much more. 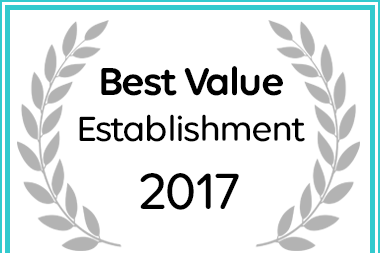 Acacia Guest House has been named a Best Value Sandton Establishment.